1) Turn your hobby into a side business. If you’ve got a bit of an artsy side, you may be able to earn some extra monthly income online. Crafters can sell their creations on Etsy, while artists and graphic designers may have some luck on Artonomy, Artbreak, or CafePress. Shutterbugs may try selling their photos to a stock photography website like Shutterstock, while writers might start a blog and sell advertising space on it. People who like baking could try a specific niche like cupcake toppers. Don’t forget to spread the word with family and friends that you’re looking for some side work, too: you never know when an opportunity will arise! These days, you can get paid simply for saying what you think. Market researchers are always looking for fresh perspectives to help them improve the consumer experience or determine what will be the next big thing. Browse the listings on FreePaidSurveys.net and FindFocusGroups to start getting paid for your opinion. You can even make money testing new apps on uTest. Now more than ever, it’s easy to earn some spending cash from your unwanted clutter. Create a seller’s account on Amazon.com to sell back your old books, or ship old textbooks into a site like Cash4Books, AbeBooks, or Half.com in exchange for cash. Likewise, old DVDs, CDs, and games can be recycled on other websites. If you’ve got old furniture or big electronics to sell, try posting an ad on Craigslist. EBay is a great catch-all site where you can sell everything from collectibles and art to sporting goods and toys. 4) Sell your body to science. This one may conjure images of science experiments gone wrong, but it’s not nearly as sketchy as what it sounds. Donate blood and plasma to your local hospital every one to two months to earn some extra cash and help those in need, and check the listings at nearby universities to see if they need people to participate in their studies. You could earn a nice chunk of change just for giving away your blood—or a little bit of your time. Are you a pro at retouching photos or solving WordPress issues? Have a talent for doing impressions or writing beautiful calligraphy? Capitalize on these specialized talents on a microgig website like Fiverr.com. You’ll earn $5 each time you perform your listed service. It may not sound like much, but you can boost your income by $100+ monthly just by performing the task once daily. Another great site for microgigs is Zaarly.com. 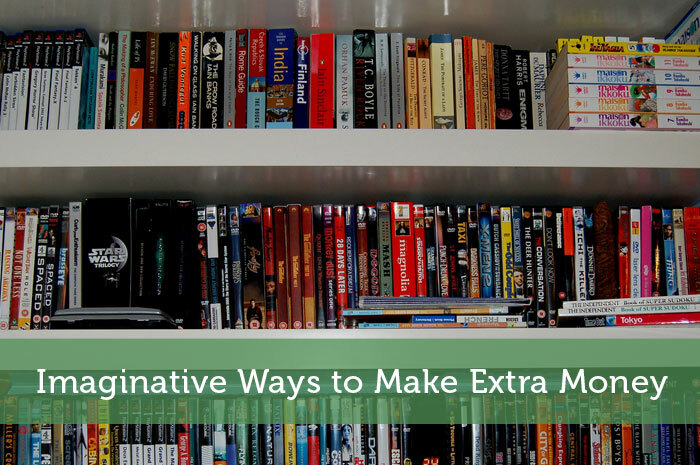 These are all great ways to make extra money! Right now I’m blogging, staff writing, and doing some virtual assistant work. I think your approach is definitely working quite well Michelle. Different people have different strengths and interests. So people need to focus on what would work best for them. You’re a great role model for others though. I love # 3. Periodically I go through my junk (yes, even my tools) and put what I don’t need, want, or can justify on Craigslist. I’m amazed at how fast some of the “junk” goes, even more so at what I get for it. I recently had a Junk CL sale and quickly turned over $400 from an old Olympic weight set, a wine fridge that was gathering sut in teh garage and my Tile saw. Not bad for a few minutes with a camera and posting an ad on CraigsList. Craigslist is great for stuff like that, but the specialty sites might be worth a shot too. I usually don’t get around to doing this until just before I’m moving and I start to realize just how much junk I have accumulated. Making some cash from that junk sure beats packing it to wherever I’m moving. I really like selling my stuff online for extra cash. Even if I just end up giving it away, its better than keeping it lying around or trashing it. For sure…I’d rather donate it to goodwill than have it end up in the trash. Even if I can’t sell it, it’s good that someone else can get some use out of it. Not only does selling your junk make you some extra cash, it also forces you to fully appreciate how much you buy that you ultimately don’t need long term. If you can reign in that kind of spending, the savings will go a long way. Good point about those other fluids lol. Great tips! We regularly sell stuff on Craigslist. Making money is just extra on the top as we usually do it to get rid of the extra crap in our house. I’m all for clearing out extra clutter too. If something is just sitting around and won’t be used again, what’s the point in keeping it? It just gets in the way. Good tips. While I’m certainly not a hoarder, I’m in the process of selling junk now. Let’s clear out some room, make some money, and get rid of clutter all at once! Actual hoarders could probably make a killing with that strategy. Most of us have at least something laying around that we don’t use anymore. We just have to stop telling ourselves that we have some kind of reason to hold onto that stuff. I have head of a few people that have done well with Fiverr. You have to know which tasks to choose, but if you do a few here and there, then you can bring in some money. That site really has taken off and a lot of the services offered are things that people can do fairly easily. It’s just a matter of being willing to put in the time to make some side money. I wish there was a UK version of fiverr. Actually the service provider only gets $4 since the site takes a cut. So you’d probably have to buy that beer at the liquor store to drink at home. I got rid of tons of stuff last summer that was still in my mum’s basement and regret not selling it, but putting ads for single items take a lot of time. If you are selling baby clothes or books you may want to offer a package. Yes offering things as a package deal is a good idea. You don’t want to be wasting time putting up dozens of ads for related items and have to deal with e-mails about each ad. Instead you can deal with it in one swoop and be done with it. The buyer would also appreciate getting a bulk deal on it all. I’ve often times thought about selling some of my junk on eBay. I could defiantly see how it could be a profitable business selling stuff that I don’t use or need anymore. It’s not exactly a long term business, but it can give a nice boost to your savings or debt payoff efforts. I donate plasma. $55 per week to sit and watch movies or read for a couple hours? I only wish I could do it more! That’s not bad money, especially if you like to read or watch movies. I think here in Canada they don’t pay for blood donations, but perhaps there are some labs that I just don’t know about. That’s interesting that they help people avoid the IRS. You’d think they’d want to be claiming those expenses, but I guess they still can as a gift. I’ve used Music Magpie in the past and it was great, I had hundreds of discs sat around gathering dust so it made sense to get rid of them. It was a little time consuming having to input all the CD barcodes but it felt worth it when the cheque arrived! I know there’s also an option to scan the barcodes using your webcam which would have speeded up the process but it didn’t seem to work for me. I wonder if they have a smartphone app to speed things up yet. Sure it takes some time to enter all those barcodes, but I’m sure it’s far easier than trying to sell those on craigslist or ebay. This is an excellent post. Right now I’m running 2 blogs and doing freelance web design to make some extra money. I bet you’re making some decent side money if you’re doing all that. Doing just one of those activities alone would be pretty profitable. My wife tried the online survey thing for awhile. she was part of three reputable companies and would take a lot of them. Man, she got such little money from them. We realized that it REALLY wasn’t worth her time! A part-time job at McDs would pay more and take up less time. No doubt…those surveys are brutally little money. The questionnaire ones are especially bad, but I have heard people getting slightly better money for the surveys done over the phone or where use you as a secret shopper. I couldn’t be bothered though. I know my time is more valuable than that. That brand name stuff is especially good to sell since a lot of people want it but aren’t willing to pay the huge retail prices. Tutoring is another in demand opportunity. Due to the poor public school system kids need extra help now more than ever. You can also find customers for your service on craigslist. Solid suggestion Darnell. I have a friend who does tutoring at the college he previously attended. It seems like a solid way to earn some extra money and probably looks pretty good on your resume if it directly relates to your career. We sell all of our daughter’s outgrown clothes on Ebay or in consignment. She grows so fast, it seems there is a neverending supply. It isn’t a ton of money, but we tend to use that toward vacations. I’m not looking forward to that endless clothing shopping when I have kids. I’m sure I’ll be all over trying to resell that stuff and trying to find used clothes as replacements. Maybe some store can even give me some old tags to trick them into thinking it’s brand new. I have done 3/5. Thanks for mentioning the micro-gig websites, I will definitely be looking into those. Making extra side income is always fun and I enjoy the challenge! It is a rewarding challenge to try to find ways to make side income. Having a daytime job can only take you so far, but having side income can really take things to the next level. If you’re lucky you can come across an income source that is particularly lucrative. Perhaps your blog will eventually become that for you. Not sure if I would want to sell my body to science but I certainly am up for selling any junk around the house. One thing we can’t stand is accumulating junk that just collects dust especially if someone can love it for some money!! I don’t think I’m desperate enough to try that either. If I was in a pinch maybe I’d consider it though. Getting rid of junk is definitely a win-win though. Fun advice! I’ve been doing great selling my clutter lately. I highly recommend it! I especially like that strategy because it prevents stuff from going in the trash. If someone else can get good use out of it, that’s less crap that needs to be manufactured and less resources that go into making that crap. Good ideas! I wonder how many of us turned writing into blogging? I could write but I wasn’t a “writer” before. I enjoy reading and passing on knowledge which is my true inspiration for blogging. Writing was more of a requirement to it. ha! It seems that most bloggers in that situation. I still wouldn’t consider myself a writer, but it is helping me make some decent side money. I’m the same way in that I like passing on knowledge, although I admit I’m better at that when it comes to my blogging tips series. I guess that’s where guest writers come in. Very true. Everyone has some kind of skill. Even if you’re not the very best at that skill, it can be put to use making money. As you get going those skills just progress and it eventually can become a full on side business. Or it can just be casual side income on whatever schedule works for you. All great words of advice. I’m currently writing my blog and looking for free lance gigs in order to generate extra income. Freelance gigs can be some decent money, but I definitely prefer blogging due to the long term potential. The work you put in today can help build your blog into a strong asset that produces income for years to come. Nice set of ideas. I love Fivrrr. I have used their services. Same for eLance and oDesk. Great ways to make an extra bit of cash. I’ve never actually used any of those sites as a service provider, but I’ve hired people through all of them. My preference is elance due to the quality of work on there, but the prices are higher. So if you wanted to make more money, that would be the better site to get established on, but the competition is likely tougher. In Australia you don’t get paid for giving blood. It is run as a donation system. Same deal here in Canada, but I suspect if you look into it further you can find various pharmaceutical companies that would pay. Old stuff like that can be pretty valuable especially if you kept it in good condition. I’ve got a box full of hockey cards that I’m hoping will be worth more some day. Only problem is that I wasn’t too good at holding on to the more valuable cards. I just sold a bunch of stuff I didn’t need/use anymore on craigslist. I made about $200 after fees etc. and was pretty pleased with myself. It’s not a way I could make money every month (I’d run out of stuff to sell), but every 6 months or so I try to round up the stuff I don’t need and sell it. Doing this periodically is definitely the way to go. After just 6 months you’d be amazed at how much of your possessions you simply don’t need anymore. I’ve done focus groups before and they are fun. You usually get $50-$100 to taste new products, listen to music or watch commercials. That actually sounds like a decent money, especially if you’re actually interested in the stuff you’re testing. I might have to ask you about that at one of our future blogger meetups. Like Edward shared earlier in the comments, I donate plasma and can earn $55-$60 a week (depending on if they’re offering a bonus) if I do it twice a week. I didn’t get there this week at all, and I only made it once on each of the last two weeks. I use the time while I’m donating to catch up on email and podcasts. And I use the money to do special dates and activities with my 5 kids. That can add up to some decent money over time, especially considering you can do other work while there. I might have to look into opportunities like that around here. Thanks for all these tips. These are all very helpful, though I do not like the idea of selling body to science. No that one is a bit questionable, although I’m sure some of the tests are completely harmless. You’d have to be a bit desperate to do the riskier tests. Some religious folks might think it’s wrong and immoral. But Nothing could be further from the truth. Giving blood every so often is one of the best ways to help others. You might help the person live in some cases. I don’t really understand religions who are against blood transfusions. I’ve heard of them refusing help when blood could save their lives. Some religions really should update with technology and medical advancements. Yes unfortunately a lot of people just lack the motivation to seek out sources of side income. People with debt problems in particular should be looking into things like this. Even if you don’t make a lot of money from a certain source, it all adds up. It beats sitting around watching tv claiming you can’t pay off your debt quicker.